228 pages | 25 B/W Illus. Strong stakeholder engagement is perhaps the most critical factor for achieving successful program execution in our fast-paced world. Many program managers get stuck in the "science" of program management, spending vast amounts of effort on tasks, charts, and metrics. Program managers who emphasize activities around relationship building and stakeholder engagement usually have the best chance for program success. 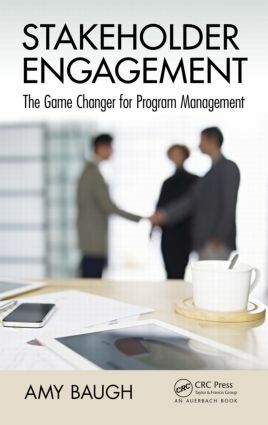 This book focuses on how to engage your stakeholders in the right way, and keep them engaged throughout the course of your program. The first section of the book covers stakeholder engagement in the program definition phase, including how to identify key stakeholders, gain their trust, and build relationships through effective communication. The second section moves to the project execution phase. It explains how to drive stakeholder engagement through the use of performance metrics, effective meeting management, and informal program governance. In the last section, the author explains how to keep stakeholders engaged through the program closure phase. This section covers the operational readiness review, including transition plans, new process documentation and training, new technology rollout, and cultural readiness assessment. It also provides best practices and tips for holding the post-launch review and lessons learned session. The book concludes with a case study of a fictitious company, followed by discussion questions that allow you to apply the knowledge you have gained in this book. Metrics: How Much Is Too Much? Amy M. Baugh is the president and founder of Milestones Project Management, Inc., providing strategic consulting services across portfolio, program, and project management. With over 15 years of practical program and project management experience across multiple industries, sectors, and geographies, Amy is a sought-after mentor and has recently begun expanding into formal mentoring, training, and education services related to program and project management. It is hard to write a bio about Amy without acknowledging her life outside of work—raising four boys! Keeping her family "stakeholders" engaged and in line with family goals is a challenging program in itself. Amy is a member of the Project Management Institute (PMI), and is certified by PMI as a Project Management Professional (PMP) and Program Management Professional (PgMP). Additionally, she holds a master of business administration with a concentration in change management from DePaul University, and a bachelor of business administration degree from Illinois Wesleyan University. Previous to writing this book, Amy published a chapter entitled "Closing the Expectations Gap: Setting and Managing Expectations" in Ginger Levin’s Program Management: A Lifecycle Approach (Baugh in Levin 2013).